You are very welcome, Good to hear you are enjoying your new truck. You are very welcome. My wife will never drive my truck, but loves her Tahoe. Maybe rent a Tahoe for the weekend and have her be the primary driver, stuff her purse in the center console, put down the rear two rows of seats to compare interior space for work, let the kids sit everywhere to explore the space, and use the right pedal to merge onto the freeway, the rig will sell itself. Just curious, where are the controls (buttons) for On Star functions in your truck? Welcome to the site and congratulations! Black K2"s always look awesome! The wife went from a loaded 2014 4-Runner Limited to her 2016 Tahoe, and would not even think about going back to the small SUV's. She did look at the same year Sequoia's, drove one overnight and did not like it at all, liked her 4-Runner better. Problem with both was gas mileage, and so far outdated on technology and design compared to the Tahoe (LTZ). Don't think you can go wrong with the big GM SUV's. From the website, options: Bose® sound system Available 6 speakers 7-speakers with subwoofer when ordered with bucket seats Enjoy clear, true sound reproduction with this premium system Bose® is renowned for expert sound engineering and high-quality audio and with premium speakers positioned throughout the cabin, you’ll get rich, concert-like sound *May require additional optional equipment. Found this, will do some more searching: Available packages include: (bench seat) a premium Bose system, complete with 6 high-performance speakers and Active Sound Management; (bucket seats) a premium Bose system with 7 high-performance speakers, including a Richbass woofer, and Active Sound Management. Very nice mod! Part number, price? Congratulations, and welcome to the site!!! I like the Jeep (Willys?) across the street, pretty cool looking. Welcome to the site. Did you buy the truck new? I would check with your dealer and see if there has been any updates (TSB's) done to the truck. There are a few post on here about trucks being stuck in 4WD and the owners not knowing about, and other problems with the system. Welcome to the site! Did your truck happen to be CPO? If it was your warranty is extended past the normal 36/36. Here is my 2014. 6.2, 6 speed with a 3.42 rear end. It was a pretty quick truck. If you take it in, I am sure you will hear, "functioning as designed". I think it is just normal for these seats. You are very welcome. Not my old truck, I know which town it is in Washington state. Where do you go to see if your VIN is involved? Or is that a total for all vehicle's sold during that period? Had Cooper Discoverer on two prior trucks, good price and a really good tire for the 20" rims. fog lights on when in auto high beam mode??? You are very welcome. 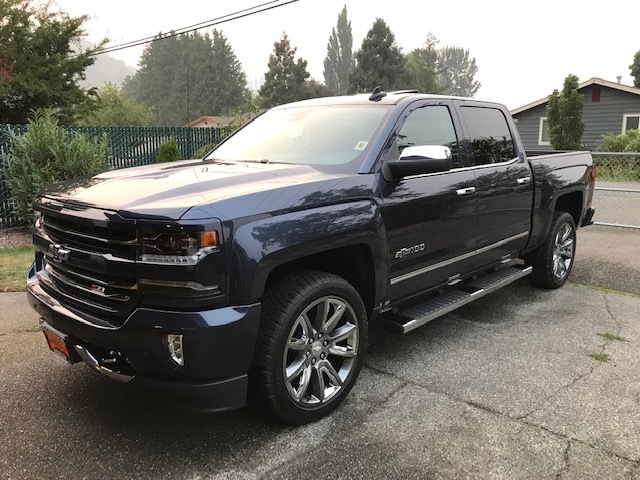 At the top of this page you will see different tabs, click on the Silverado/Sierra Mods tab, the link is at the bottom of page #4. Do not think so, it is set up from the factory like that. Right there with you though, it would be nice to be able to use the fog lights with the function turned on. Maybe post this question in the "What would you like to see Pgamboa do next". Best bet on how to figure this out. Welcome to the site. Great looking truck, looks exactly like the 14 that I had. Where are you located?